So another rest day passed, slowly and peacefully in Whitehorse. We found a lovely coffee shop, a brilliant restaurant and a Walmart! The hotel laundry went into overdrive and the internet went into meltdown. When we left this morning the feeling that we’re coming to the end of the Rally was backed up by the feeling that we’re at the end of the world. Mile after mile of nothing but trees, lakes and rivers. The sky was grey, the rain light and the wind none existent.The dustv trails from the cars hung around for a long time after the cars had passed. Two regularity sections which totalled something like 40 miles took the Rally well off the beaten track around the shores of the beautiful Frenchman Lake. Flying the flag, quite literally, for the Queens Jubilee (you might have seen something about this on the news) were Roy Stephenson and Peter Robinson. They sailed through the whole day with Union Flags flying from their Datsun. When they got to the night halt we found them in the car park with the wheels off the car checking out a ‘funny noise’. Nothing untoward was found though and they put the whole thing back together before tucking into BBQ salmon in the Dawson Westmark dining room. 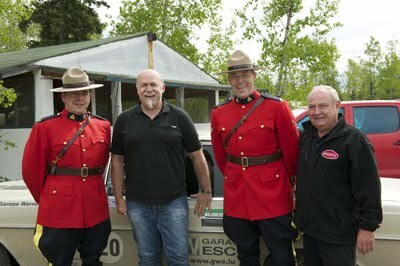 The Mounties paid a visit to the Rally today at the PC at Mamma's Kitchen and very pleased we were to see them. Two RCMP Troopers including the Pelly Crossing Detachment Commander Cpl J.B. Waldner saw the first few cars arrive and hurried home to change into full dress uniform. When they returned they were more than happy to pose for photographs and do more than a bit of glad handing. Other important news is that the leader board has changed after the regularities. Gerry Crown and Matt Bryson have lost their lead by 13 seconds to Richard Worts and Nicola Shackleton who’ve been sniffing around the top spot all week. Tonight we’re in Dawson the one time capital of the Yukon. It’s a real frontier town with working gold mines. The treets are dirt and the sidewalks are boardwalks. As we write we’re sat in Bombay Peggy’s a ‘saloon bar’ with Who Bear tuning up and jamming in the background. Theyre a local five piece band who’ve only been together for three weeks so they haven’t got anything on iTunes yet. With rhythm guitar, drums, double bass, violin, ukulele and keyboards they’ve certainly got the full set and they know how to use them. They’re playing live at 8.00pm which unfortunately is when we sit down to eat so we’ll miss them but the rehearsal was pretty good. 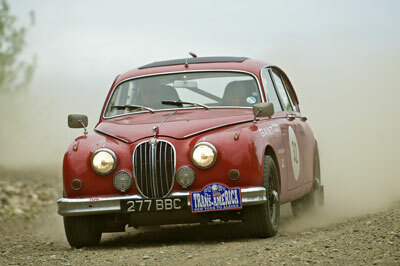 Philip Young the Rally Director has found his niche tonight. He’s been driving the shuttle Landrover between the hotel and Rally carpark. He last visited the town in 2000 as part of the Round the World so finally he’s putting his local knowledge to good use.